We've included these panel pictures just to show our source but sorry, these are not good images. 515216 Sapper (George) Frederick Bagwell of the Royal Engineers. Adopted son of Henry and Sophia Aggett; husband of Alberta Bagwell. Born in Newton Abbot in the September Quarter of 1884. Died in 1919 aged 35. 25055 Private Alfred Charles. Bailey of the 8th Battalion, the Devonshire Regiment. Son of Alfred and Emily Bailey of East Street, Newton Abbot. Born in Newton Abbot in the September Quarter of 1894. Died as a prisoner of war 24 November 1917 aged 23. Formerly employed at Newton Tanneries. 42268 Private Joseph Claude Bailey of the 2nd Battalion, the Princess of Wales' Own Regiment (known locally as the "Alexandra Regiment"). Son of Frank and Eleanor Bailey; brother of Lewis (see below). Born in Newton Abbot in 1897. Died 22 March 1918 aged 21. 240256 Private Lewis Edgar Bailey of the 1st/5th Battalion, the Devonshire Regiment. Son of Frank and Eleanor of 23 Waltham Road ,Newton Abbot; brother of Joseph (see above). Born in Newton Abbot in 1895. Died 14 November 1917 aged 23. 236394 Able Seaman Leonard Charles Mudge Bailey of the Royal Navy, HMS Monmouth. Son of Charles and Elizabeth Bailey. Born in Highweek in 1889. 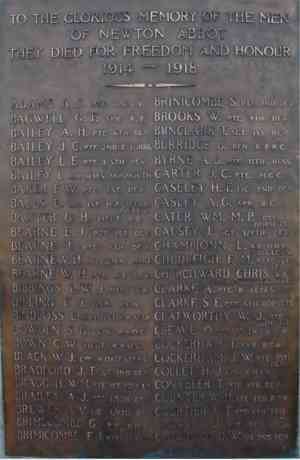 Died 1 November 1914 aged 25..
9503 Private Frederick Walter Baker of "B" Coy, 1st Battalion, the Devonshire Regiment. Son of Samuel and Charlotte Baker. Born in Torquay in 1896. Died 30 October 1914 aged 18. 10/2077 Lance Corporal Edmund Balls of the 1st Battalion, the Wellington Rifles, the New Zealand Expeditionary Force. Son of Rhoda Balls and the late Henry Sykes Balls. Born in Stratton, Cornwall, 19 August 1880. Educated at Newton Abbot Grammar School. Emigrated to New Zealand in 1905. Died 12 October 1918 aged 38. Lieutenant Gavin Hector Baxter of the 157th Field Company, the Royal Engineers. Born in Hornsey Rise, London, in the September Quarter of 1887. Died 23 March 1918 aged 31. Worked for Newton Abbot Urban District Council as an assistant surveyor. 20493 Private Edward James Bearne of the 1st Battalion, the Devonshire Regiment. Son of Emma Bearne and the late Albert Bearne. Born in Newton Abbot in the March Quarter of 1897. Died 23 April 1917 aged 20. Z/400 Able Seaman Victor Hugh Bearne of the Royal Naval Volunteer Reserve, Drake Battalion, the Royal Naval Division. Son of Rosina Ellen Bearne and the late Frederick Bearne. Born in Newton Abbot in 1896. Died 25 March 1918 aged 22. 18193 Private Walter Henry Bearne of the 1st Battalion, the Devonshire Regiment. Son of William and Selena Bearne. Born in Newton Abbot in 1896. Died 4 October 1917 aged 34. 113335 Driver Lewis William James Bibbings of the 172nd Brigade Ammunition Column, the Royal Field Artillery. Son of lewis and Elizabeth Bibbings. Born in Newton Abbot in 1899. Died 30 July 1917 aged 18. 183642 Gunner Frank J. Billing of the 1st Battery, 45 Brigade, the Royal Field Artillery. Son of Mary Elizabeth Billing og 3 Mile End Cottages, Highweek, Newton Abbot and the late Frank Billing. Born in Newton Abbot in 1898. Died 13 April 1918 aged 20. Major Edward Alexander Morgan Bindloss of the 1st/ 5th Battalion, the Royal Warwickshire Regiment. Husband of Margery Bindloss of Knowles Hill, Newton Abbot. Born in Archangel, Russia in 1876. Worked as a Consulting Engineer and resided in Russia prior to his marriage in 1900. Died 15 June 1918 aged 42. 05849 Corporal Sidney George Bowden of the 124th Coy, attached to the Stavros Ammunition Depot, the Royal Army Ordnance Corps. Son of John and Lucy Bowden of Newton Abbot; husband of Daisy Hamley Bowden of Decoy, Newton Abbot. Born in Newton Abbot in 1886. Died 14 July 1918 aged 32. Lieutenant Cecil Bertini Watkin Bown of the 4th Auxiliary petrol Coy, the Royal Army Ordnance Corps. Son of William and Frances Bown; husband of Florence Bown of Sidmouth. Born in Newton Abbot in the June Quarter of 1881. Died 20 March 1917 aged 36. 34500 Corporal William James Black of the 6th Battalion, the Worcestershire Regiment. Son of Susan Ann Black of Courtney Street, Newton Abbot and the late James Black. Born in Newton Abbot in the June Quarter of 1894. Died 11 November 1919 aged 31. 8083 Sergeant John Thomas Bradford of the 2nd Battalion, the Devonshire Regiment. Son of Emma Bradford and the late Arthur Bradford. Born in Newton Abbot in the September Quarter of 1894. Died 4 October 1917 aged 26. 400023 Private (Wilfred) Henry Bragg 1st Battalion, the Somerset Light Infantry. Foster child of Henry and Bertha Bragg. Born in Newton Abbot in 1900. Died 30 August 1918 aged 18. 240384 Private (Arthur) James Brailey of the 1st/5th Battalion, the Devonshire Regiment. Son of Henry and Bertha Brailey of the Grove, Newton Abbot. Born in Newton Abbot in the December Quarter of 1884. Died 29 July 1918 aged 34. 4407 Lance Corporal Alfred Verney Brewer of the 1st/9th Battalion ( Queen Victoria's Rifles ) , the London Regiment. Son of John and maud Brewer of Keyberry Park, Newton Abbot. Born in Redmarley, Worcs in 1893. Died 1 July 1916 aged 26. K 5201 Petty officer George Henry Brimecombe of the Royal Navy, HMS Opossum. Son of Richard and Mary Jane Brimecombe. Born in Kingsteignton 20 December 1891. The date of his death is not yet confirmed. 13848 Private Francis John Brimicombe of the 1st Battalion, the Bedfordshire Regiment. Son of John and Mary Brimicombe. Born in Newton Abbot in the September Quarter of 1891. Died 9 March 1915. 68083 Private Sidney Charles Brinicombe of the 2nd Battalion, the Devonshire Regiment.. Son of Lewis and Annie of Abbotsbury Road, Newton Abbot. Born in Newton Abbot in the June Quarter of 1891. Died 24 April 1918 aged 18. 26473 Private William Henry Brooks of the 9th Battalion, the Devonshire Regiment. Son of Thomas and Eva Brooks. Born in Newton Abbot in the March Quarter of 1898. Died 26 October 1917 aged 19. 8085 Sergeant John Bunclark of the 2nd Battalion, the Devonshire Regiment; transferred as 311561 to the 641st Employment Coy, the Labour Corps. Son of John and Alice Bunclark. Born in Chudleigh Knighton in the September Quarter of 1895. Died 7 November 1918 aged 30. Buried in Newton Abbot Cemetery. 5085 Rifleman Benjamin Samuel Burridge of the 2nd Battalion, the King's Royal Rifle Corps. Brought up by his grandmother, Elizabeth Dodridge, who kept the Star Inn, Ilsington. Born in Ilsington in the September Quarter of 1896. Died 17 September 1914 aged 18. 18094 Lance Corporal Alfred John Byrne of the 6th Battalion, the Bedfordshire Regiment. Son of Lucy Byrne (father absent in military). Born in Lucknow, India in 1896. Died 10 July 1916 aged 20. 47159 Private James Charles Carter of the 1st Squadron the Machine Gun Cavalry; formerly 29756, of the 14th Reserve Cavalry Regiments. Son of James and Charlotte Carter. Born in East Dawlish in the March Quarter of 1892. Died 22 March 1918 aged 26. 14184 Lance Corporal of the 2nd Battalion, the Devonshire Regiment. Son of Henry and Johanna Caseley of Halcyon Road, Newton Abbot. Born in Dawlish in 1895. Died 10 May 1915 aged 19. 44774 Sapper Arthur George Casley of the 92 Field Coy, the Royal Engineers. Son of Samuel and Sarah Jane Casley. Born in Highweek, Newton Abbot in the December Quarter of 1891. Died 5 October 1916 aged 25. 20567 Private William Matthew Paul Cater of the 4th Battalion, the Dorsetshire Regiment. Son of Jessie Cater of The Retreat, Powderham Road, Newton Abbot and the late Harry Cater. Born in Newton Abbot in the September Quarter of 1899. Died 18 June 1918 aged 18. 200391 Sergeant James Causey of the 1st 4th Battalion, the Devonshire Regiment. Son of the late William and Maria Causey. Born in Newton Abbot in 1886. Died 16 December 1918 aged 32. 4403 Able Seaman (Engine Room Artificer 3rd Class) Leonard Champion of the Royal Navy, HMS Bittern. Son of Emma Jane Champion of Vale Road, Decoy, Newton Abbot. and the late Robert Champion, Born in Lostwithiel, Cornwall, 27 February 1887. Died 4 April 1918 aged 31 when HMS Bittern was run down by a merchant ship in the English Channel. All hands lost. 6887 Private Frank Michael Chudleigh of the 1st Battalion, the Devonshire Regiment. Son of Fanny Chudleigh of Wolborough, Newton Abbot and the late John Chudleigh. Born in Newton Abbot in the March Quarter of 1880. Died 23 October 1914 aged 37. K/5158 Leading Stoker Christopher Churchward of the Royal Navy, HMS Indefatigable. Son of Charles and Mary Churchward of Exeter. Born in Newton Abbot 8 Nov 1890. Died 31 May 1916 at the Battle of Jutland aged 25. 11020 Lance Corporal Alfred Clarke of the 5th battalion, the Royal Berkshire Regiment. Son of Mrs A. Clarke of Bude Terrace, Windsor. Born in Newton Abbot in 1894. Died 27 June 1917 aged 23. Awarded the Military Medal. 24209 Private Sydney Edgar Clarke of the 5th Battalion, the Dorsetshire regiment. Stepson of Frank Strawbridge and Annie Strawbridge (formerly Clarke) of Newton Abbot . Born i n Plymouth in the June Quarter of 1890. Died 4 February 1917 aged 28. 27074 Private William John Clatworthy of the 7th Battalion, the Somerset Light Infantry. Husband of Elizabeth Clatworthy of 1 Manor Cottages, Wolborough Street, Newton Abbot. Born in Newton Abbot in the September Quarter of 1880. Died 4 August 1918 aged 31. 7172 Rifleman Owen Cleave of the London Regiment (The Queen's Westminster Rifles). Son of Sarah Cleave of Polyblanks Terrace, Newton Abbot and the late Edwin Cleave; husband of Olive Cleave. Born in Newton Abbot in the June Quarter of 1890. Died 16 December 1916 aged 26. Gunner Frank Cockerham of the Royal Field Artillery. Son of John and Charlotte Cockerham; brother of John (see below). Born in Kingsteignton in December 1891. Died 1916 aged 27. 3/7047 Private John William Cockerham of "A" BCoy, the 10th Battalion, the Devonshire Regiment. Son of John and Charlotte Cockerham of Kingsteignton; husband of Emily Cockerham of Wolborough Street, Newton Abbot. Born in Kingsteignton in 1890. Died 27 April 1917 aged 26. PLY14601 Private John Henry Collett of the Royal Marine Light Infantry, HMS Indefatigable. Son of Andrew and Sarah Collett of Leamington Spa. Born in Leamington Spa 4 August 1884 - later moved to Exeter. Died 31 May 1916 at the Battle of Jutland aged 32. 10640 Private Thomas Conybeer of the 8th Battalion, the Devonshire Regiment. Son of Albert and Elizabeth Conybeer of Halcyon Road, Newton Abbot. Born in Newton Abbot in 1893. Died 25 September 1915 aged 22. 84109 Driver Frederick Thomas Courtier of the 16th Battery, the 6th Brigade, the Canadian Field Artillery. Son of Thomas and Mary Louise Courtier; husband of Edith Courtier of Fore Street, Kingsteignton. Born in Newton Abbot in 1895. Died 4 September 1918 aged 23. 24347 Private Alfred James Cross of the 2nd Garrison Battalion, the Hampshire Regiment. Husband of Lillian Cross of Egerton Street, Cardiff. Born in Newton Abbot in 1880. Died 6 December 1918 aged 38. 26310 Private George William Crowfoot of the 2nd Battalion, the Devonshire Regiment. Son of the late Jane Crowfoot (w). Born in Chelmsford, Essex in 1882. Died 2 April 1918 aged 36.